Consultations at All Animal Eye Services are by appointment only. We strongly recommend you have a referral from your General Practice veterinarian, because it is very helpful if you can bring along your pet's medical history. Your General Practice Vet can also help you decide if referral is the best option. Your initial consultation will take around 30 minutes and you stay with your pet the entire time. During the consultation, we will take time to listen to your concerns and make notes about what you have been noticing with your pet. 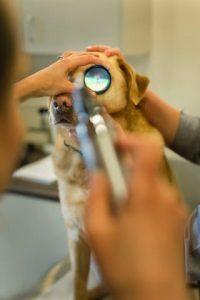 We will then perform a full examination of your pet's eyes, including the eyelids, the cornea (the clear "window" part of the eye), the iris, the lens and the retina (the nerve tissue at the back of the eye). 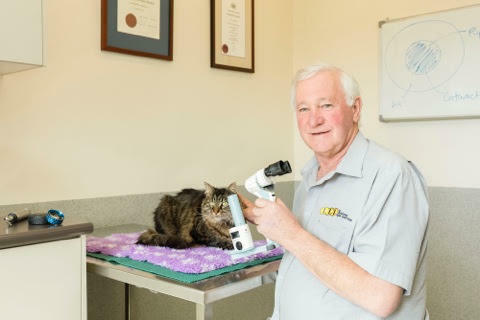 Using specialised equipment such as a hand-held microscope, we are able to see all the structures within your pet's eye. If needed, we can also run simple tests such measuring the pressure inside the eye for glaucoma or measuring tear production. Your pet will feel no discomfort at any time during the examination or testing. After a diagnosis is made, we will carefully explain your pet's eye problem and go through information sheets and diagrams with you. We will detail all your options for treatment, including costs that may be involved and will answer any questions you may have. You will be given a written summary, information sheets and diagrams to take home with you and we will send a copy of our findings to your General Practice Vet so they are aware of your pet's diagnosis and treatment. Routine consultations at our Mount Waverley Clinic are from Monday to Friday. Every Monday afternoon we consult in Kensington at Advanced Vet Care: Level 1, 26 Robertson Street, Kensington. Every Thursday afternoon and once a month for a full day we consult in Werribee at the U-Vet Werribee Animal Hospital: 250 Princes Highway, Werribee. We also regularly travel to major regional centres throughout Victoria and Tasmania. Please phone (03) 9808 2822 for details and bookings. Emergency consultations can be seen as a priority at short notice. Any surgery required can only be scheduled after a consultation with one of the Ophthalmologists. In many cases, if surgery is anticipated, a consultation and surgery can be performed on the same day. Fees are payable in full at the time of consultation or surgery and can be paid by cash, cheque, EFTPOS, Mastercard or Visa. We look forward to helping your pet see clearly.